Society of Certified Senior Advisors: Plant and Outdoor Therapy: Worth It for Seniors? Many surprising research findings tout the advantages of plants and flowers in an older person’s life. Whether it’s tending to a plant in their room, enjoying houseplants in communal residence areas or having exposure to greenery in the great outdoors (even through a window), seniors see undeniable benefits. And while you may agree from your own experience that you seem to feel better when Mother Nature is nearby, research proves that it’s affecting you in ways you probably never imagined. Early Greeks and Romans were among the first to bring plants indoors. Louis XIV continued the tradition with the orangery at Versailles, and potted palms were in vogue during Victorian times. What were the 70s without some spider plants in macramé hangings? We’ll avoid discussing the cannabis plants that might have also been lurking in a few homes, since they have distinctive medical properties and a federal drug designation. Common houseplants confer many surprising health benefits of their own, and they’re perfectly legal in all 50 states. In fact, after seeing the evidence, you may decide to run out and buy some for yourself! Plant roots take up water, push it out to the leaves, and release some of it via evaporation. This process, called transpiration, accounts for about 10 percent of the moisture in the atmosphere. When you bring a living plant inside, the same process adds humidity to the air in your home. Seniors have various alternatives for indoor gardening. The easiest, of course, is to set a potted plant in a south-facing window. But many older Americans don’t have a sunny window, or can’t bend down to tend to plants. For them, we look at systems that are compatible with older adult lifestyles. Eldergrow offers a unit that is accessible for anyone, including those using a wheelchair. The mobile unit can travel around a senior housing facility, with locking wheels to temporarily or permanently keep it in place. Eco-friendly grow lights are safe and energy efficient, while a 4-by-2-foot bed offers space for various plants. 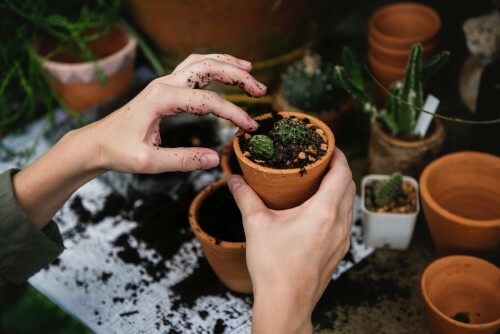 Founder Orla Concannon developed the startup to satisfy a graduate course requirement after a stint as marketing director for Aegis Senior Living, where she saw the disappointment and sadness of residents who missed gardens they had to leave behind. The company has been growing since a September 2015 launch, with a presence in six states. The company offers three ownership models: rent, buy or rent to own, the most popular option. In addition, Eldergrow can provide evidence-based horticulture therapy using a subscription-based curriculum. If you’re looking for a simpler system without the educational component, try Fresh Square Countertop Growing Units for easy indoor gardening. Each unit measures 20 inches wide by 14 inches deep and stands 20 inches tall to include grow lights. There’s no bending over, since the units sit on your counter, and their unique watering system allows you to go on vacation or even forget about plants for up to three weeks. In dry climates and winter months, this humidity reduces your risk of dry skin, colds, sore throats and dry coughs, according to a study at the Agricultural University of Norway. Other research has found that the flu virus prefers dry air for optimal survival and transmission, so lower your flu risk by growing plants indoors. You may know that during the day, plants take in carbon dioxide and release oxygen. This makes them an asset for people, who do the opposite. Growing plants increase oxygen levels indoors. But were you aware that photosynthesis, or the exchange of carbon dioxide and oxygen by plants, stops at night? Instead, plants switch modes to absorb oxygen and emit carbon dioxide. Keep this from happening in your bedroom at night by choosing plants from the few (including orchids, succulents and epiphytic bromeliads) that continue to emit oxygen in the dark. Experts at researching air in sealed environments, NASA found an unexpected air quality improvement. “Both plant leaves and roots are utilized in removing trace levels of toxic vapors from inside tightly sealed buildings,” say NASA researchers. “Low levels of chemicals such as carbon monoxide and formaldehyde can be removed from indoor environments by plant leaves alone.” To be effective, NASA studies suggest one plant per 100 square feet of indoor space. According to the space agency’s research, the top 10 plants to clean the air are: peace lily, golden pothos, English ivy, chrysanthemum, gerbera daisy, mother-in-law's tongue (also known as snake plant), bamboo palm, azalea, red-edge dracaena and spider plant. Check here for more air-cleaning plants and information regarding their culture and care. Bringing a plant or flowers to someone recuperating from surgery may seem uninspired. However, one study at Kansas State University recommends them as an effective complementary medicine for surgical patients that has the added advantages of being noninvasive and inexpensive. Viewing plants during recovery, according to the study, produced significant improvement in physiologic responses, demonstrated by lower systolic blood pressure and patient reports of lower pain, anxiety and fatigue when compared to patients without plants or flowers in their rooms. Patients with plants or flowers gave more positive feedback about their rooms and evaluated them with higher satisfaction ratings when compared to patients in similar rooms with no plants. Patients with plants also gave higher rankings to hospital caregivers. Can caring for live plants replicate or boost these findings? When patients physically interacted with plants by caring for them, a Texas A&M study found, they showed a significantly reduced recovery time after medical procedures when compared to those who didn’t. While few studies have looked at the effect of plants on indoor environments for seniors specifically, there is evidence from research in office and school settings that plants make a dramatic difference in memory retention, concentration and productivity. Being “under the influence of plants” increased memory retention up to 20 percent, according to one University of Michigan study. If brown leaves and lifeless stalks haunt your memories of plant care, take heart. Some houseplants are a lot easier to grow than others. Here are some plants that are OK with a little neglect, plants that will restore your sense of self-esteem and accomplishment. We’re going to make it really simple and give you broad categories of easy-care greenery anyone can handle. Keep in mind that most commercially available plants have been treated with pesticide at the greenhouse. Often, it’s a systemic variety that is absorbed into the plant’s system and can remain there for months or longer. To avoid bringing a toxin into your home, ask for plants that have been grown organically. Succulents. This group is as varied as the desert landscape. They like good light and drying out between less frequent waterings than other plants. Their thick leaves store water, making them tough and hardy. Don’t let water sit in the tray underneath the pot of a succulent, or it’s likely to get root rot. Put stones or gravel in the tray to lift the pot and avoid overwatering altogether. Varieties to try include the popular snake plant, or even a cactus. Violets. Want something that will flower? Violets don’t require a lot of light or attention to produce blooms for months. The secret? Water violets from the bottom, never the top of the pot. Put water in the tray underneath and then set the pot in the water. Make sure the tray isn’t huge; violets like to be moist but not soggy. Put them in a north window in summer to avoid burning the leaves. Better yet, if you love your violet so much you’d like to have more, just cut off a leaf, dip it in root hormone (available at garden centers) and plant it in another pot. Wait a month or so for tiny leaves to push up near the stem. Pothos. It may not be the most interesting houseplant, but pothos will tolerate artificial lights, it can grow hanging or on a counter, and you can plant cuttings from the trailing stems to make more plants for you or your friends. Spice things up with gold or variegated (green plus another color) varieties. The research above demonstrates that the mere presence of plants indoors is beneficial in various ways. But can the act of caring for a living thing, in this case a plant, bestow beneficial effects? One study seems to tell us it can. Nursing home residents may feel a loss of control over many aspects of their lives. They may have little say over what they do, who they see and what they eat. Researchers split 91 subjects into three groups. The nursing home director gave the first group a speech about their responsibility for their own lives. He also gave these residents a choice of nights they could watch a movie. Finally, each resident in this first group received a plant and was told that they would be responsible for its care. A second group listened to the same speech, but with all references to personal responsibility omitted. This group was assigned a movie night and told that a nurse would care for the plant. The last group had no speech and didn’t get a plant. Results were dramatic. Residents in the first group became happier and their activity level increased. After 18 months, with no additional differentiation, only 15 percent of residents in the first group had died compared to 30 percent in the last two groups. Abundant studies have shown that garden settings provide numerous benefits, including a reduction in pain, stress, agitation, and falls; an improvement in attention, sleeping patterns, and vitamin D absorption; and a decrease in the need for antipsychotic and “take as needed” medication. Not only do these factors improve quality of life, but they may reduce costs in a residential setting. Designed for dementia patients, wander gardens are a new take on an old concept. All plants in the garden are edible, the garden itself is enclosed to prevent straying, and all paths lead back to the residence. One study found that inappropriate behaviors of patients at a locked facility decreased substantially within 30 minutes of their finding the unlocked door to such a garden. One company that started out designing therapy gardens for patients in hospital settings branched out to assisted-living communities. Designs for Generations owner Jack Carman, tipped off by his wife who works in geriatric management, studied how therapeutic gardens could affect mental behavior, especially among people with cognitive disorders. “Good therapy for patients and their families notwithstanding, therapy gardens also provide a welcome change of pace for doctors, nurses and other caregivers, whose jobs are both demanding and often very stressful,” says Carman. With evidence pointing to the importance of plants in the environment, planners needed a measurement to determine how to best meet older adults’ needs for time spent outside while in residential home care. The Seniors’ Outdoor Survey (SOS) is an observational tool for assessing how well outdoor environments at long-term care settings support residents’ preferences and usage of the space. Ratings are given in five categories: access to nature, outdoor comfort and safety, walking and outdoor activities, indoor-outdoor connection and connection to the world. A total of 60 items across the categories are ranked, giving institutional designers solid goals for spaces that enhance the resident experience. The tool aims to eliminate typical barriers to outdoor access such as inadequate shade and seating, unsafe walkways and self-locking doors. Researchers found that prior to the development of SOS, it was difficult to determine which environmental characteristics best supported the use of outdoor space. “What Is the Evidence to Support the Use of Therapeutic Gardens for the Elderly?,” NIH. “5 health benefits of houseplants,” Treehuger. “5 Benefits of Houseplants,” Bayer. “Ornamental indoor plants in hospital rooms enhanced health outcomes of patients recovering from surgery,” National Center for Biotechnology Information, U.S. National Library of Medicine. “Ellison Chair in International Floriculture,” Texas A&M. “The Benefit of Pets and Animal-Assisted Therapy to the Health of Older Individuals,” National Center for Biotechnology Information, U.S. National Library of Medicine. “Studies Prove that Desk Plants Can Improve Worker Concentration and Productivity,” Inhabitat. “Long-term effects of a control-relevant Intervention with the Institutionalized Aged,” Centre for Confidence and Well-being. “The Seniors’ Outdoor Survey: An Observational Tool for Assessing Outdoor Environments at Long-Term Care Settings,” Oxford University Press. “Wander gardens: Expanding the dementia treatment environment,” Research Gate.